Tomorrow my first play for Very Young Audiences – A Bucket of Blessings – will close at the Alliance Theatre in Atlanta after a one month sold-0ut run. The play is an adaptation of the best selling children’s book written by Surishtha Sehgal and Kabir Sehgal, and as a TVYA play, is meant for an audience of 0-5 year olds. A Bucket of Blessings was directed by the ridiculously brilliant Rosemary Newcott, and I developed it in the rehearsal room with Rosemary, our cast, our choreographer, designers, and of course, our multiple adorable test audiences. Me, top right, with our lovely cast. It was a very intensive writing process, perhaps the most intensive theatre project I’ve done so far. Here are the two things I want to take with me from that experience into future plays. Theatre for very young audiences is, more than anything else, 100% about the audience and only the audience. 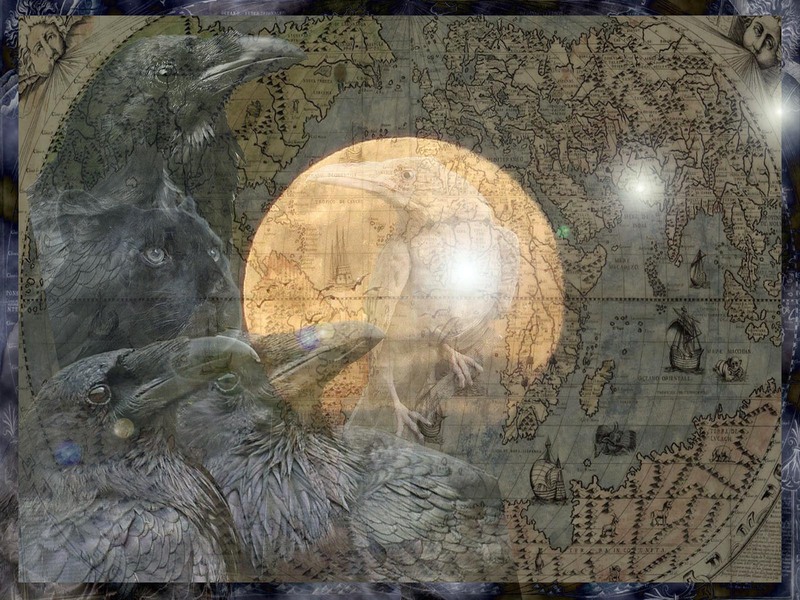 There’s no room for the artist’s ego, the artist’s special voice, for flourishes, for statements. The only thing that matters is the audience. For a TVYA writer, this comes from a point of love. How could you not love these little ones? How could you not desperately care for them, and want with all your heart for them to have a safe, enriching, adventurous time in the theatre? Now let’s take that same sacrifice of ego and unhesitating love for the audience to our work for grown ups as well. 2. Every second counts. Every line matters. When children are that young, and their attention spans so brief, we are aware that every second we have with them is precious. The work we did in rehearsal was the most precise, exacting writing I have ever done. We worked hard on crafting every single moment to mean something, to engage the audience, and to carry the story forward. Let’s be as ruthless as that with our writing for adult audiences. Even when we don’t have to be. We must admit that playwrights are often coddled. 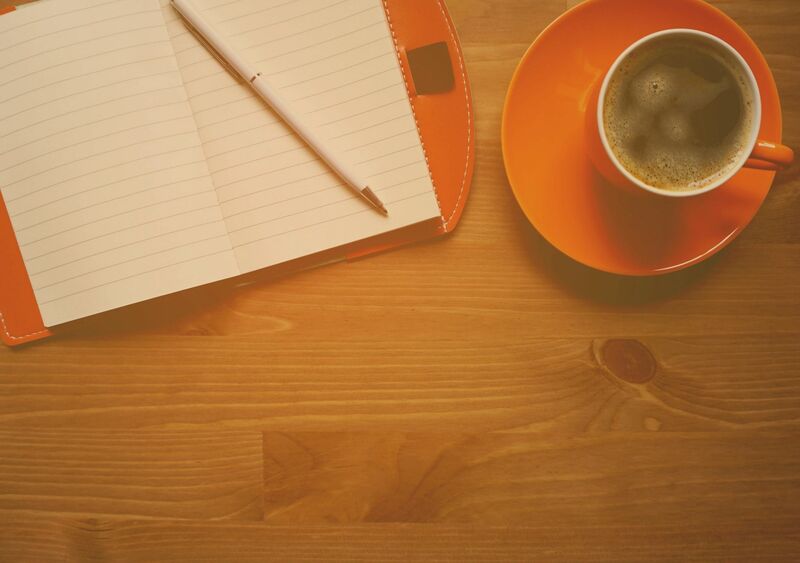 What we lack in monetary compensation we make up for in creative control, but sometimes that can get indulgent. So the next time we’re in a room with our collaborators, let’s take our play to task, moment by moment. Is every single line crafted in the exact way required to communicate the story to the audience? Is every pause earned? Every word vitally necessary? 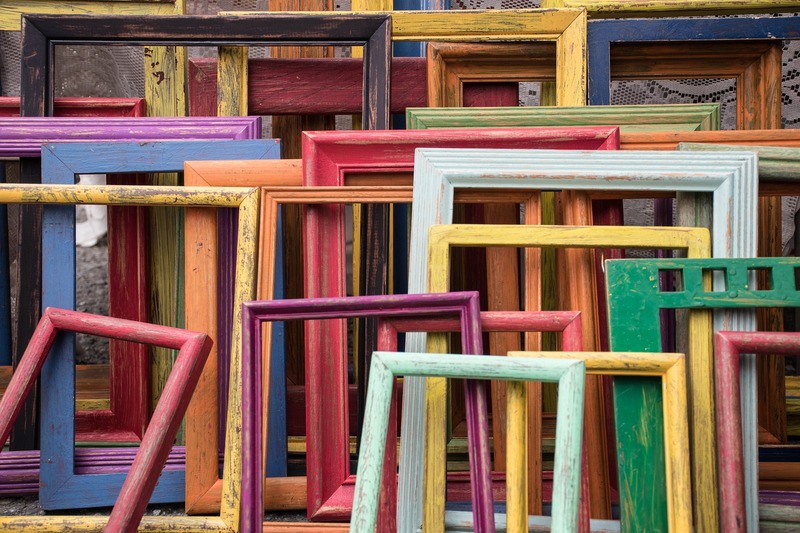 Seriously, what if our audience had the attention span of a toddler? Would our play still work? Have we built something captivating enough, engaging enough, to truly serve the audience that’s spending their precious time with us? We should be doing these things anyway, but nothing brings it into perspective like trying to keep a room full of 2 year olds inside the world of your story. 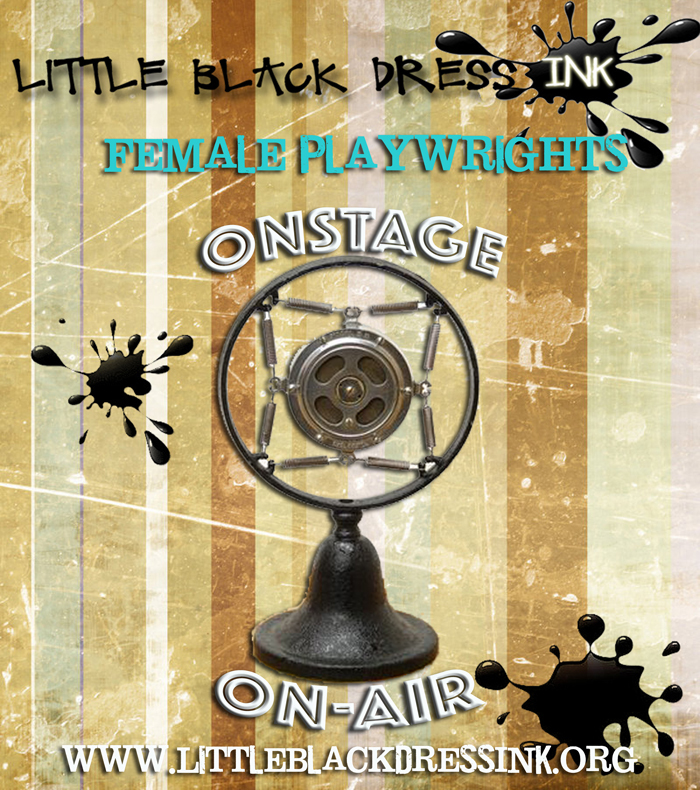 Have you seen or worked on a play for very young audiences? What did you take away from the experience? 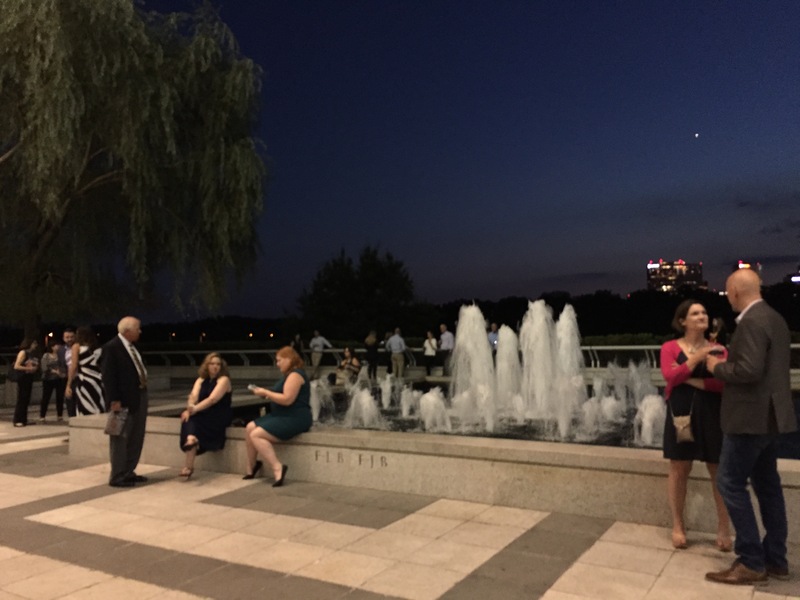 I had plans for another blog post this week, but I stumbled into something a lot of fun this weekend, and now I’m going to write about that instead. Because I want all my theatre friends in LA to know about this awesome community project going on in Boyle Heights. I’ve lived in Boyle Heights for 5 years, and I absolutely love it. It’s a warm, friendly, welcoming neighborhood full of family-run businesses and amazing street art. 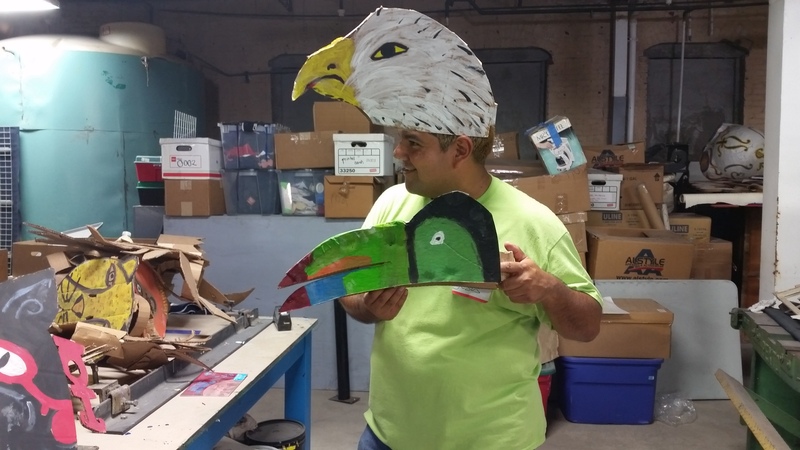 For at least a year now, I’ve been aware of ‘The Shop’, a new community engagement program that the Center Theatre Group has been running in Boyle Heights, where through workshops, classes and events every weekend, local residents are invited to participate in art and theatre making. My friend Jesus Reyes, Creative Artistic Director of East LA Rep and CTG Program Manager, facilitates and leads the team managing this wonderful initiative. I’ve seen his pictures and updates on Facebook for months now, but due to travels and a crazy schedule, I never actually was able to go. Until now! Yesterday morning, I was taking a walk and happened to see that CTG had set up their ‘Shop’ at Self-Help Graphics on 1st street. Excited, I stopped in to say hi to Jesus, and found out that they were going to be making masks and puppets – MASKS AND PUPPETS – all day! The stars aligned. My afternoon was free. I stopped by with my roommate for the afternoon session and got to dive right in. Examples of the final product! So the program that’s happening right now is the ‘Community as Creators’ project. 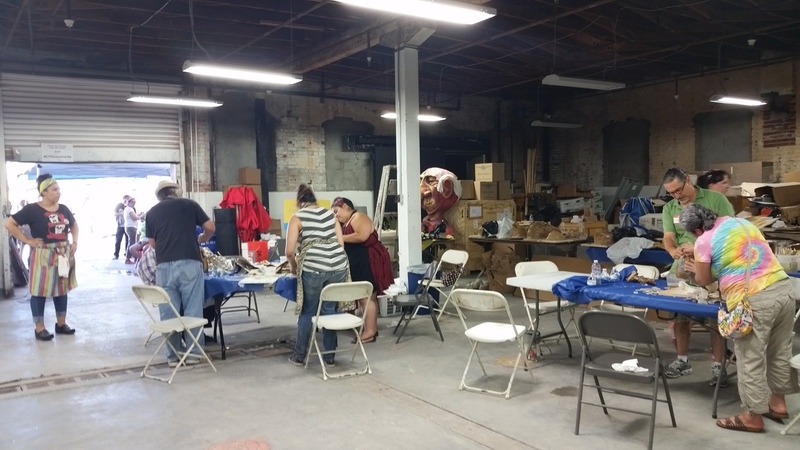 Over the course of several weekends this summer and fall, Boyle Heights residents gather to collectively create and shape a show that will be a retelling of the Mayan legend of Popul Vuh. The show will go up in October at Hollenbeck Park in Boyle Heights, and Grand Park in Downtown LA. 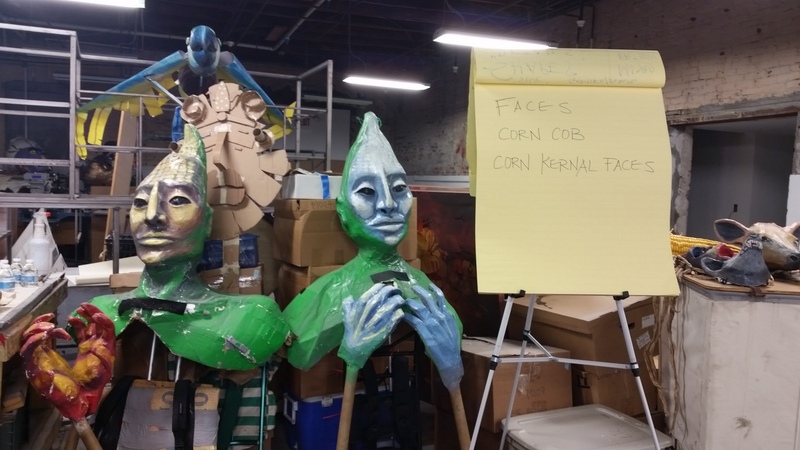 These community workshop participants help create the characters, props, music, and may also eventually act in the show, depending on where their interests lie. When I stepped in this weekend, the process was already several weeks underway. 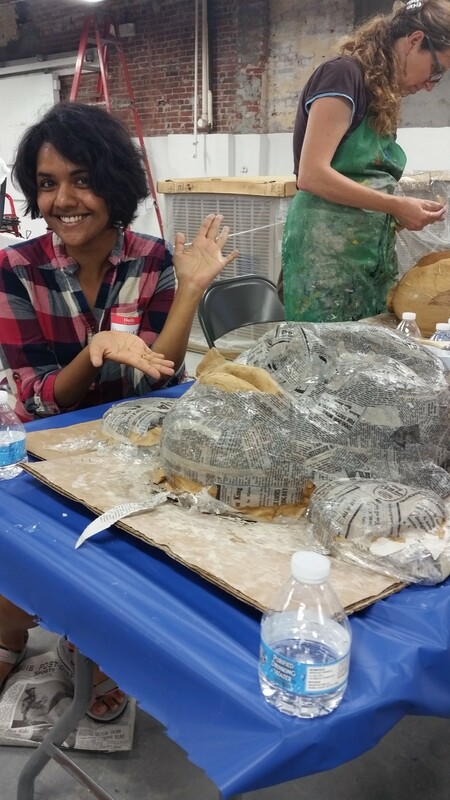 So what I got to do was help paper-mache the giant masks that will be used on stage! I can’t tell you how much fun it was to lose myself completely in this crafts project after weeks and weeks of sitting at my desk writing. I got to know my neighbors in the best, most organic way, as I shared tables with people from all over East LA (I even got to know my roommate better!). 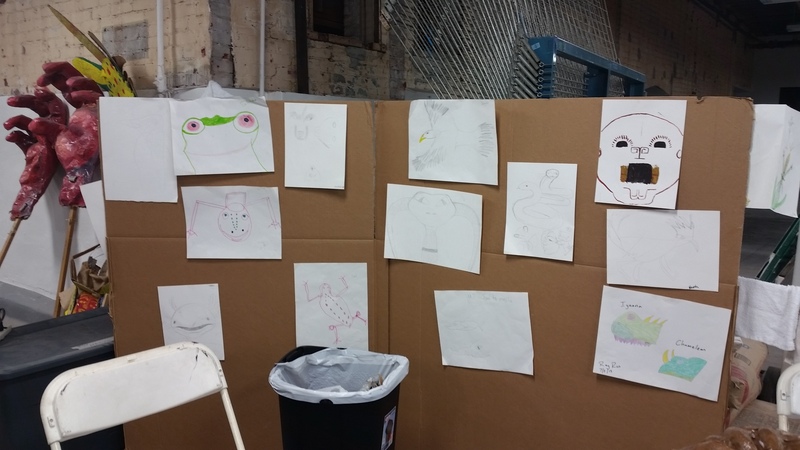 The energy was fantastic, and lots of families showed up to spend the whole day in this fun artistic activity. I did the afternoon session of Saturday, and the morning session of Sunday, and managed to get all the way through paper-mache-ing a giant human mask! Me, at the end of Day 1 with our paper mache man! 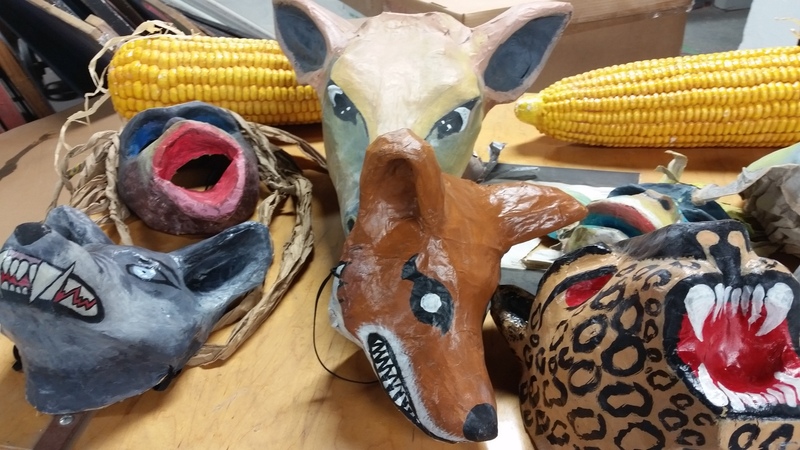 Major props to Teatro Campesino who are producing this project, and Beth Peterson, the puppet artist who guided all the workshop participants through the process of creating these beautiful, vivid masks. LAFPI readers – I highly recommend checking this out next weekend in Boyle Heights. 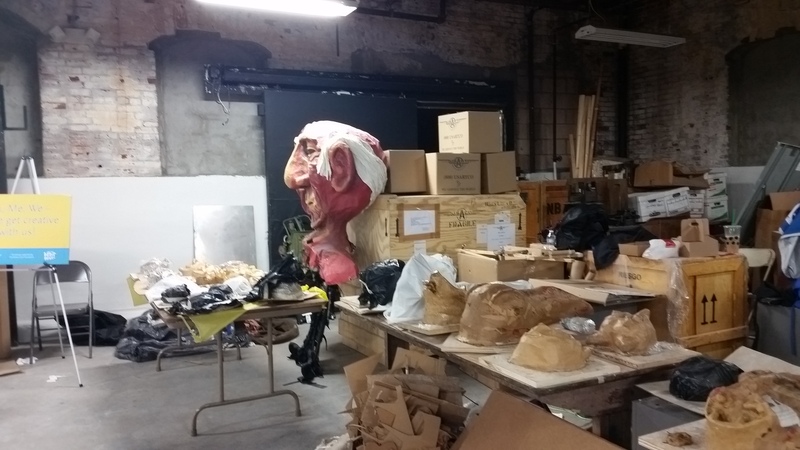 The paper mache process will still be underway (it will actually be the final weekend of the mask workshop). It’s a rewarding, relaxing, even therapeutic way to spend a day, collectively creating something that will be part of a beautiful theatrical presentation, truly representing the heart and spirit of Los Angeles. Here’s the blurb with more info! Or tweet me at @madplays with any questions on the experience. 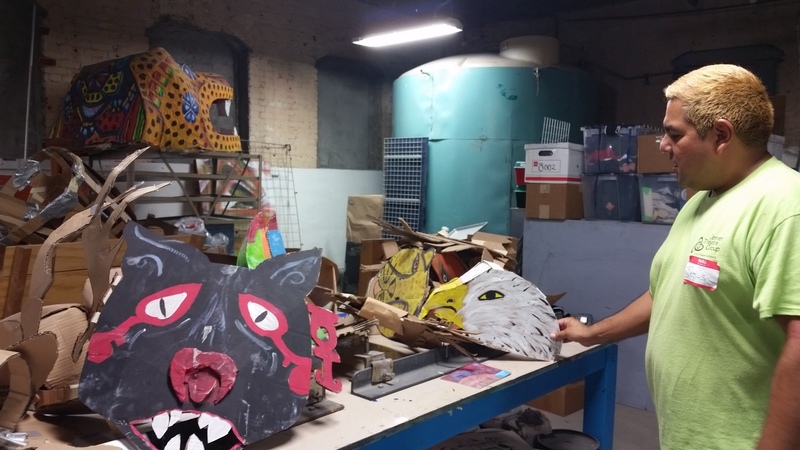 Free Puppet and Mask Making Workshops! Discover the artista in you! 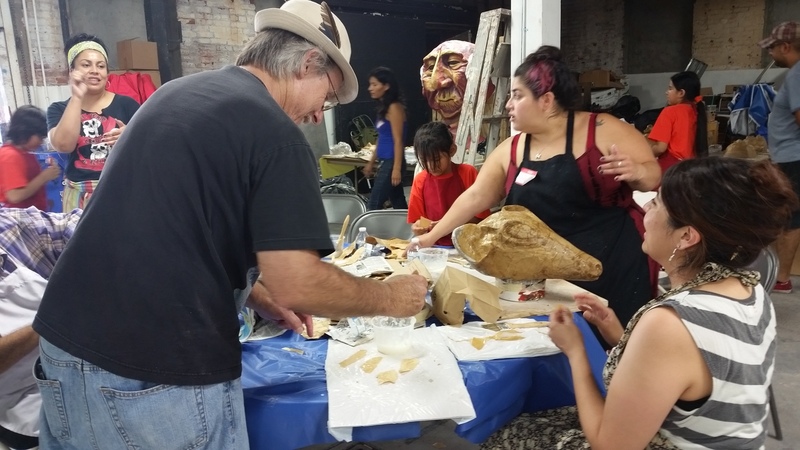 Come and help us create puppets and masks for the upcoming El Teatro Campesino production of the Popol Vuh: Heart of Heaven based on the Mayan creation myth. 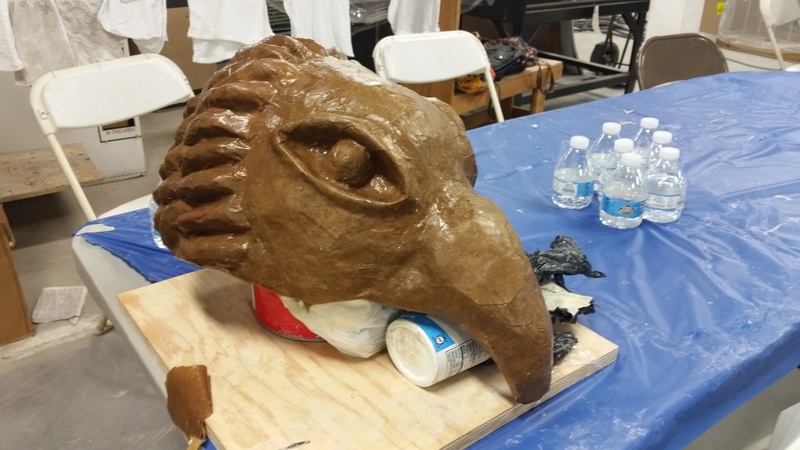 Master Puppet Maker la Beth Peterson brings her special talent to Boyle Heights and needs gente to help her build giant puppets, wood people and animal masks that will be part of the show. Come on, show off your talent, join us! • Bilingual in Spanish/English • Open to all levels of experience • Open to all ages • All materials will be provided • Snacks & beverages provided.